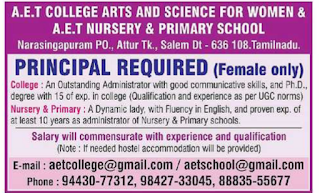 A.E.T Group of Institutions, Attur has advertised in THE HINDU newspaper for recruitment of Principal (Female)jobs vacancies. Interested and eligible job aspirants are requested to apply immediately. Check out further more details below. 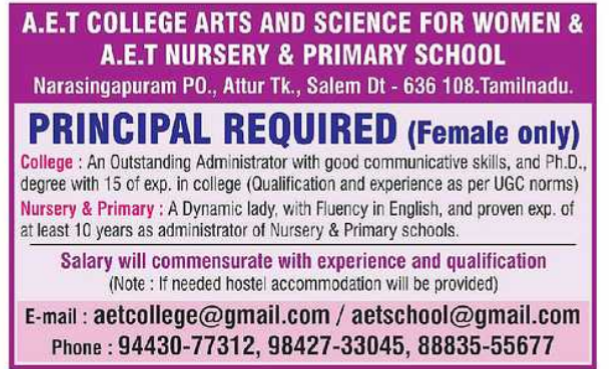 Name of the College : A.E.T College of Arts and Science For Women & A.E.T Nursary & Primary School. About College A Group of few dedicated retired Teachers, Head masters, Businessman, Engineers, a Principal and Agriculturist joined together to establish the Attur Educational and Charitable Trust in the year 2002, with the aim of starting an Arts & Science College in Attur. Though all the formalities for starting the college were fulfilled in the year 2002 itself, the dream has come true only during the year 2005-2006 by getting the approval from the Government of Tamilnadu and Affiliated to Periyar University. College: An outstanding Administrator with good communicative skills,and Ph.D., degree with 15 yrs experience in college. Qualification and experience as per UGC norms. Nursary&Primary: A dynamic lady, with fluency in English,and proven exp.of at least 10 years as administrator of Nursary&Primary Schools. Note: If needed hostel accommodation will be provided.